If you are considering using a live trap to capture a fox on your property, this article is meant for you. You may not realize that there are more effective options available to you before resorting to a fox trap. Here you’ll find helpful, practical ways to troubleshoot the problem and avoid the pitfalls associated with trapping. At first you may be frightened to learn that there are foxes living in your neighborhood, but these fears are usually baseless. 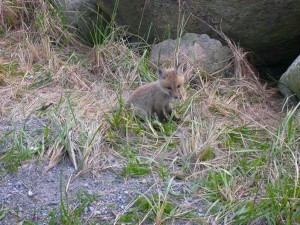 Since foxes are very adaptable, they are commonly seen in urban and suburban yards, appearing almost tame. It is common for people to not even be aware that they are there. On average weighing only 14 pounds, fox are not looking to harm your children or drag off your pets. They’d much rather provide you with free rodent control since mice and rats are their main source of food. There will be many “Kodak moments” when there are fox denning in your yard. Consider yourself lucky if you have foxes denning in your yard. Keep a camera handy so you can film the kits coming outside, romping and playing like puppies. 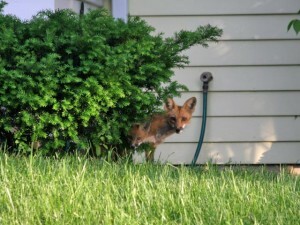 Many people have foxes denning in their yards all over the country; such an occurrence is not a public safety risk and can be thoroughly enjoyed as some of the very best “reality” nature TV. Don’t put meat or fish in your compost pile, and use a closed bin, rather than an open pile, for composting. Put trash in a tightly lidded container and use a bungee cord on the lid. If you put pet food or water outside, only put out as much as they will consume while you’re still there to remove the dishes. Don’t let spilled birdseed pile up underneath feeders, where it attracts rodents, which, in turn, attract foxes. Remove fallen fruit and nuts from beneath your trees. Wash grills after use and remove the drippings container to eliminate the scent of food. Monitor small cats and toy breeds of dogs when they are outside, and keep rabbits, guinea pigs, and chickens in a sturdy shelter made of welded wire mesh with a solid floor and a lock. If a fox is denning on your property, depending on the season she likely has kits or is planning to. Rather than setting a trap for her and risk separating her from her kits, wait until any young are able to follow her out of the den, and then, use the techniques listed below in combination to make her feel uncomfortable with her den choice and encourage her to choose a denning site elsewhere. Place urine soaked kitty litter, a sweaty T-shirt, or sweaty socks in the den opening if you want to send an eviction message. Loosely stuff the hole with dirt or mulch for extra harassment value. Keep replacing the loose material each morning until the material remains in place for a few days. Attach Mylar balloons or 1.5 ft. lengths of Irri-tape® to dowels or garden stakes 24 to 36 inches off the ground just outside the entrance of the den. To determine if the fox family has left, block the hole loosely with wadded up newspaper. Leave in place for two to three days. If it remains undisturbed after that time it is safe to assume they have vacated the area. Now you can take steps to seal up the entrance with heavy-gauge wire or other sturdy materials to keep unwanted wildlife out permanently. Trapping fox often results in orphaned babies left to die of starvation. Live trapping foxes usually never ends well for the fox and it will not solve the original problem. What will you do with the fox if you trap it? 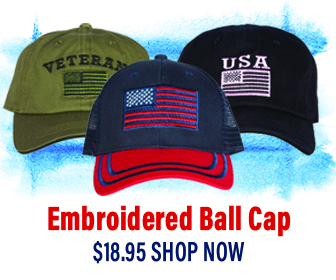 And what would you do with the kits left behind or the kits you catch? Read on to learn why this method is not as humane as it may seem. 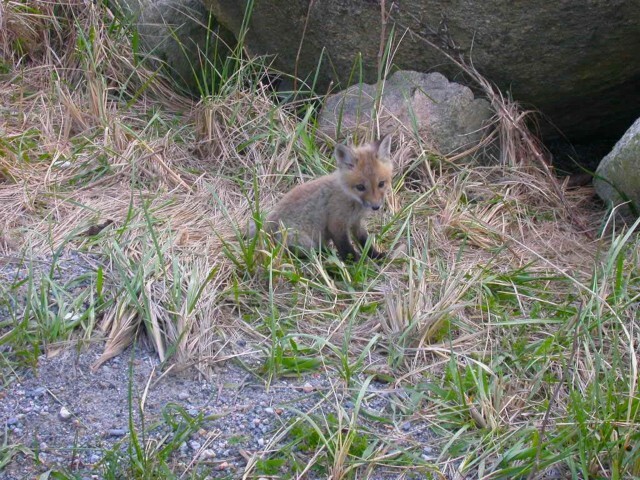 Between March and June, you may only see one fox in the area but you must assume that she is a mother fox with a den and kits nearby. Not being aware that there may be babies during spring and summer, trapping will almost assuredly result in orphaned kits that will likely die of dehydration and starvation as a result of the mother being trapped. This is especially true if the kits are not yet old enough to emerge, or come out from the den. If the kits have emerged, then the kits, which are still dependent on mom, will wind up in the trap. When foxes are trapped and moved to new areas, they are unfamiliar with the locations of food, water, and shelter. They are also in competition with other established foxes and studies have shown that for these reasons they do not survive long. In many states, it is illegal to trap without a permit, and/or illegal to trap and relocate wild animals. Homeowners are strongly discouraged from trapping foxes and instead, encouraged to use eviction and exclusion strategies, or contacting a wildlife control professional.